Adani has been chosen as a supplier of the mobile X-ray body screening solution for the Danish Customs Service, SKAT. 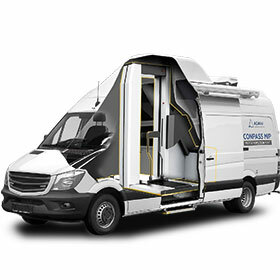 Adani working together with NORAD A/S, Denmark and Hartmann GmbH, Germany have been awarded a contract to design, develop and supply the CONPASS MIP mobile full body security screening system to cover the needs of the Danish Customs Service in screening of potential drug smugglers, attempting to import illicit substances into Denmark. The demand for more complete personnel screening systems is increasing in many key markets as a result of a mixture of events and the realisation by the enforcement agencies that the technology exists to safely screen for a wide range of banned and dangerous items. The Adani CONPASS product line has demonstrated that its robust design, high performance and flexibility has proven popular with an increasing range of international customers. creates new opportunities for the mobile security market.